And welcome to my stop on the “Monster” by C.J. Skuse blog tour. Today I have a review of the title but I will also have an author interview in the next couple of days. Hope you’ll enjoy and feel free to hop on the other stop on the tours help by a list of fab bloggers!! In truth, I have never been one to gravitate towards stories whether in movies or books where the setting is in a boarding school. I have always felt that once you have read or viewed one of those stories, especially when a murder has been committed, you have seen them all. Well, I still feel the same, however I found that “Monster” was highly entertaining, so much so that when I picked it up I read it in one sitting, which is not something I do very often. I literally could not put it down, and the few times I had to, I was not happy to do so :). The main protagonist is a sixteen year old girl named Nash (short for Natasha), whose sole ambition is to become Headgirl of Bathory Boarding School. She works extremely hard at it only for the title to be given to a less deserving girl. One little slip! And the opportunity was simply snatched away. No time to dwell though, as it turns out that Nash will have to call upon an entirely different set of skills, one different from what would be expected from a Headgirl. One she will need if she is to survive what is to come, for at this time of the year, the rumored “Beast of Bathory” is lurking around the school grounds. And as far as the plot goes, it is as much as I am willing to tell you, as my interest with his book lies between the lines. This book basically made me think a little, as it explored or maybe prompted the reader to consider different expectations from those placed on your traditional hero/ine and what his/her instinct and reactions are supposed to be when faced with a life or death situation. “Monster” explored the notion that, in order to survive you may have to unleash your inner monster to fight another. The question remains however, for the ordinary person and the kind at heart, who may not be familiar with his or her monster. Once unleashed, how difficult will it be to tame or restrain, if at all possible? Do you then become a monster? I will leave you with that thought and recommend that you pick up this title if this review has piqued your interest. 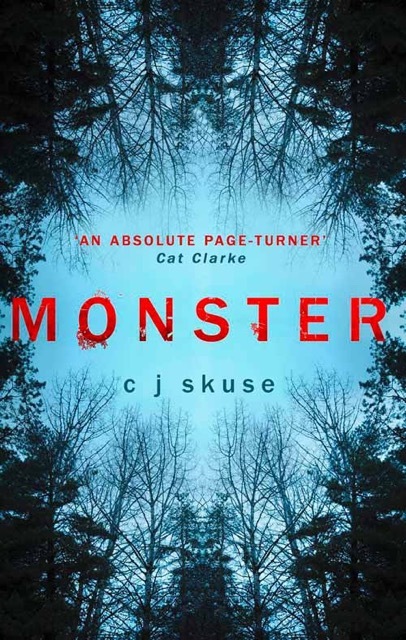 As for me, now that I have had a taste for the “Monster”, I will gladly explore what other pieces C.J. Skuse has to offer.